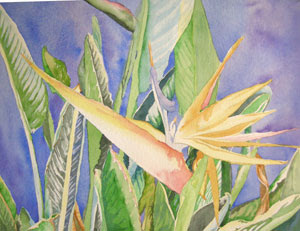 Here is another installment on the progress of my Bird of Paradise painting. I have continued to add glazes around the entire painting. Here I have begun to add more yellow and gold glazes on the actual flower. I used Quinicridone Gold, which I think is a beautiful, transparent alternative to Yellow Ochre. Yellow Ochre tends to be more opaque and, when used as a glaze, appears cloudy or dull. Quinicridone Gold is very transparent and adds a delicious glow to the yellows. This glaze was added fairly wet so that it is built up gradually. I added it to a few of the green leaves, as well, to warm those areas.